The mission of the University of Maryland Medical System in Southern Maryland has always been to provide members of our community with essential health care services in nearby locations. We believe that everything from hospital services and surgical care to physical rehabilitation and primary care should be no more than just a short drive away. And now, we’re excited to announce that high-quality breast care is available closer to home than ever. 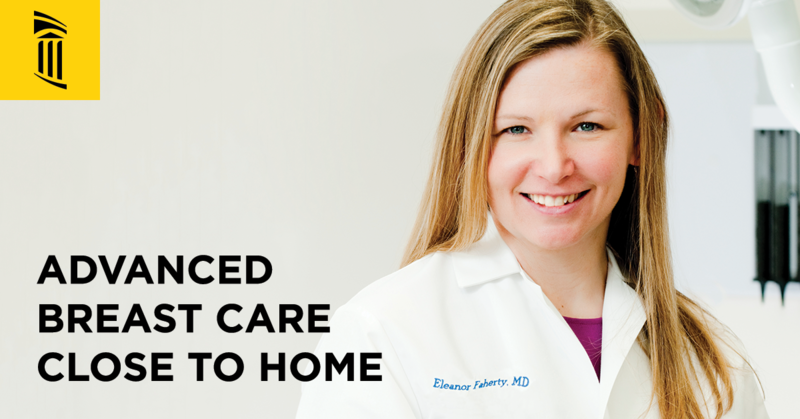 Eleanor Faherty, MD, FACS, combines advance techniques and a compassionate approach to provide greater outcomes for patients with breast health issues — all in a convenient Waldorf, MD, location. A graduate of Albany Medical College and an Iraq War veteran, Dr. Eleanor Faherty has become one of Southern Maryland’s most respected and recognizable health care professionals. You can learn more about Dr. Faherty’s background, education, affiliations, and certifications on her profile on our website. Dr. Faherty’s practice proudly accepts most major insurance plans. Please contact your medical insurance provider to find out if your procedure qualifies for insurance coverage or financial assistance. You can also call (410) 328-7320 to find out what plans are accepted. Ready to learn more or schedule your appointment? Simply call (301) 609-6363 today. Welcome to UM Charles Regional Medical Center. We are dedicated to providing nothing less than the very best care to each patient, in a safe, caring, and family-centered environment. Care is the factor that differentiates UM Charles Regional: Our people are what set us apart. What’s the Scoop on Getting Your Vegetables and Fruits? Why It’s Important to Add Color to Your Plate. © 2018 All rights reserved. UM Charles Regional Medical Center. 5 Garrett Avenue, La Plata, MD 20646.